Where were we ? Ah yes, off to the pub to think about losing weight. Well, after the requisite consumption of a couple of pints of Otter I came to the unsurprising conclusion that “as any fule kno”, losing weight is a simple combination of putting less in your mouth and moving about a bit more. Of course, I already knew that as I had a moderately successful campaign to lose some weight back in 2004. On that occasion, I first forced myself on to a minimal diet before setting about the question of exercise. I rather fancied trying to recapture the glory of my youthful running days at school. It seems unreal to remember how I used to set off for a run up into the Worcestershire hills with a packet on Player’s No 6 stuffed into the back of my shorts. A couple of fags lying in the heather on the slopes of the Beacon before a carefree downhill scamper back to school. I finally knocked the fags on the head in 2002 so running without them might be a novel experience. 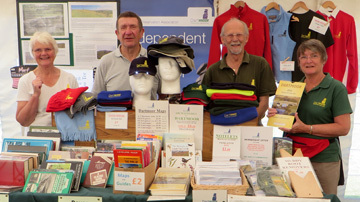 I managed to overcome inertia and started trotting around the Dartmoor hills and eventually recovered enough fitness to attempt a few organised events. 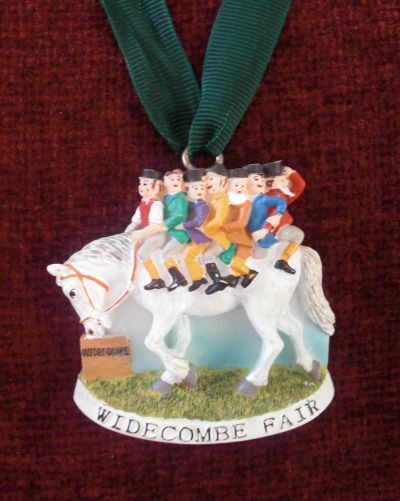 In fact, in 2004 I completed the Haytor Heller, the Lustleigh 10k, a couple of outings with the local Hashing club, the Moretonhampstead run, and one or two other local events, most notable of which was the Uncle Tom Cobbley race at Widecombe Fair. Reader, you are looking at my medal for this event, the obverse of which clearly shows the year 2004. For the uninitiated, a brief description of this event will be of interest. 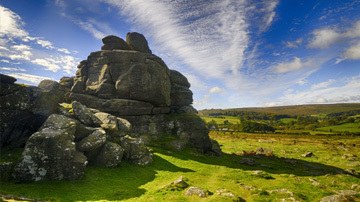 Runners are transported by bus from the showfield in the village to an indeterminate point on the Pil Tor – Top Tor – Bonehill ridge that overlooks the village. From there they make their own way back to the showfield by whichever route they choose. The race is always won by some likely local lad who has checked out the conditions beforehand and he is followed in by a stream of muddied and blood spattered competitors who have fought their way through the vegetation to get to the finish (there are no footpaths). 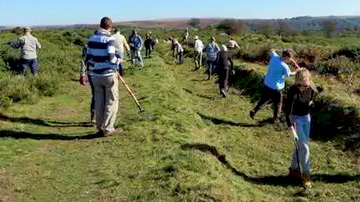 My own experience of this event (not to be repeated) included negotiating gorse and bramble thickets, fences and barbed wire. At one point I found myself crawling along the bed of a stream in order to sneak under several strands of barbed wire. Utter foolishness but I expect that Bill Brewer, Ed Stuart, Peter Gurney, Uncle Tom an’ all would have been proud. Sadly, I think I paid the price for all this jogging about as it was less than 5 years later, in considerable chronic hip pain, that I had my first hip job, followed a year later by the second. So, no running for me this time about. The secret weapon this time is to be a rowing machine. (The recouping of the extravagant investment for this equipment will be told on another occasion.) The machine duly arrived a few days before Christmas and after a few days of looking at it I decided to have a go. Achievements so far have been modest. In fact, for the first week my main objective was to avoid death by heart attack. I am assisted in achieving this by the heart monitor which tells me information that I would really rather not know. The machine records a huge amount of detail, almost every stroke is committed to the memory card showing dates and times, speed, distance etc etc. There is even a way that I can connect it to the computer to compete against myself, or computer generated pacemakers, or even against other real people, in real time, over the internet. I haven’t tried this yet but I’ll be sure to give it a go. So, part 1 of the grand plan is implemented. Several times a week I go into the shed, sit on the machine, and engage in a rather pointless exercise while listening to the radio or music, and try to send my mind to “another place”. Which brings me to a statistic which I will report on each blog post. Amongst the plethora of information the machine produces I thought distance travelled would be the easiest measure of effort. This is of course “theoretical” distance travelled as although sliding up and down the machine, I don’t actually go anywhere. In my mind I am trying to find a suitable destination; maybe Edinburgh ? Or perhaps a voyage over water might be more appropriate so how about Bordeaux ? Well, the distance so far puts me at about Junction 27 on the M5 heading north. And of course, there is the big number that is of most interest to all you sponsors which is 119.5kg or 263.3lbs. This means that I have now managed to drag myself just over the start line. Your money is not safe from now on ! Next time – Control Freak. 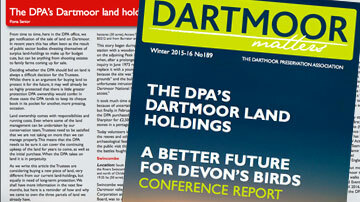 If you would like to sponsor me and raise funds for the DPA then just send me a message on http://www.dartmoorpreservation.com/contact.html Remember – you can always cap your sponsorship – and there is a £50 prize to be won. Many thanks for the encouragment Christina ! Good luck. 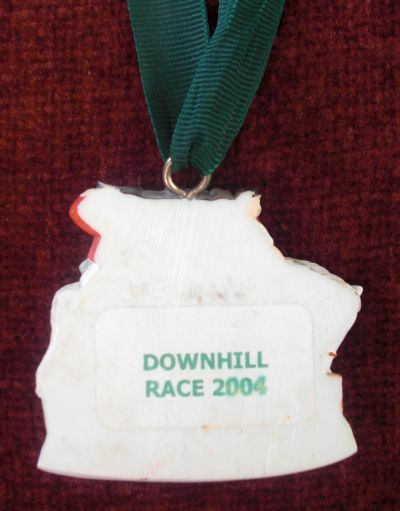 I had to smile as I saw the Tom Cobbley Race Medal scrolling into view – the “Downhill” part. I think it would kill me to do it uphill, now!